Stephen Tierney MBMG International Ltd. In the first half of this year there have been very few trends that investors could feel happy investing in. You know things are rough when Man Investments, which is now the world’s largest publicly listed specialist provider of hedge funds and alternative investment solutions manager, is struggling. Yes, there is the weak US Dollar and profits can be made in USD asset plays from such things as oil, mining, Hong Kong physical real estate, etc. But, as we can see what happened recently with the commodity market, all of this kind of thing can unwind incredibly quickly. There we have it, basically what Taylor is saying is that, over the last few weeks, the spikes and then collapses in oil, silver and gold is giving a good indication that this is the end of the bull market. However, this is not the only problem. Commodities are just one of the asset classes. There are others as well and none of them are providing a smooth ride at the moment. This is especially true of currencies. Many people are struggling with money at the moment and what its true value really is as well as the real cost. Gavekal pointed out in a research paper that potential investors are not comfortable with QE2 and the possibility of QE3 as it can be seen governments have forgotten the basics and have messed around with the “weights and measures” of the western financial system. What no-one knows is what the outcome of this will be. 2) An international price based on exchange rates. In the western world, which is predominantly capitalist, the real value of money comes about when different currencies can compete with each other freely - irrelevant of the economic or political systems. However, times have changed. This is no longer the case. Today, we have three economic powerhouses where the currency of each is not being allowed to be priced correctly. In all three cases the governments and central banks of America, China and Eurozone are manipulating the situation to suit their own needs and stuff anyone else. This means that those who want to invest in currencies do not have a level playing field in which to judge what the best strategy would be. However, many economists believe that this will not last. If you are in currencies then use a base currency and operate round that. As for the safest currency at the moment - you will not go far wrong with the Singapore Dollar. This week and next we have part 2 in a special report from Tim Price, Director of Investment with PFP Wealth Management. Investment conclusion #2: while it doesn’t make sense to hold the debt of bankrupt countries (see graph 1 for some of the more visible culprits), it makes sense to own bonds issued by the most creditworthy sovereigns. Particularly if Soc Gen’s Albert Edwards is onto something with his deflationary “Ice Age” prognostications. The Edwards thesis, in brief, is that in a cooling global economy, equities de-rate in isolation and versus government bonds, which re-rate in absolute terms. These charts come via Chris Martenson and his excellent blog. A recent post, the self-explanatorily titled “Death By Debt”, makes the damning point that we are all trapped in an expanding credit system that has run into its terminal phase. We are used to living in a financial environment in which credit has grown exponentially. 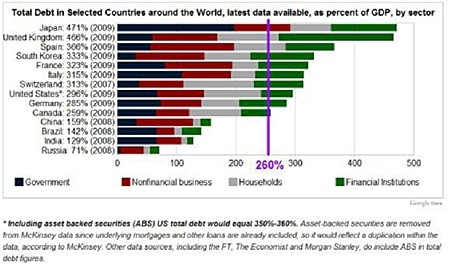 Global debt has been growing in a “nearly perfect” exponential fashion throughout the 1970s, the 1980s, the 1990s and the 2000s. Needless to say, this is not going to happen, although there would appear to be politicians, presidents, intransigent single currency blocs and bankers out there who believe it might. “It explains why Bernanke’s $2 trillion has not created a spectacular party in anything other than a few select areas (banking, corporate profits) which were positioned to directly benefit from the money. It explains why things don’t feel right, or the same, and why people are still feeling queasy about the state of the economy. It explains the massive disconnects between government pensions and promises, all developed and doled out during the prior four decades, cannot be met by current budget realities. “Our entire system of money, and by extension our sense of entitlement and expectations of future growth, were formed during, and are utterly dependent on, exponential credit growth. Note that Martenson uses the word “function” as opposed to, say, “thrive”. This is because the system has gone beyond the point of no return. Fed chairman Bernanke during his June 7th address at the International Monetary Conference in Atlanta made no explicit mention of introducing QE3. He did concede that monetary policy rates would be kept at exceptionally low levels for an extended period, but we already knew that. Like a consistently spoilt child, the equity market didn’t like what it heard and went into a sulk. But there is merit in looking beyond the short term to see the longer term trend. The Financial Times published graph 2 in its weekend edition last month. Its impact may not be immediately clear, so let us try and spell it out like crystal. 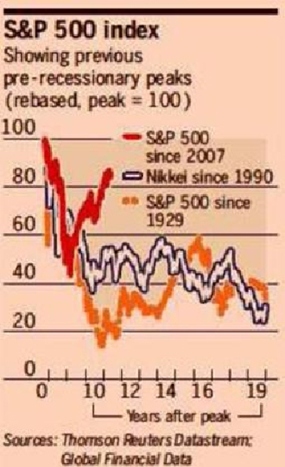 After two previous historic busts, the S&P 500 (1929 to 1948) and the Nikkei 225 (1990 to, well, today) spent the subsequent two decades losing up to 80% of their value. In other words, after a colossal boom and a once-in-a-generation collapse, equity markets can and will disappoint all those taught to believe in stocks for the long run. The last several years (the bounce in the red line for the S&P 500) would seem to diverge from the historic path implied by the other two graphs. Perhaps the recovery of the last two years was a false one, bought by the trillions of stimulus poured into the market by a desperate Fed? Time, as always, will tell. But if the comparison is a fair one, and we think it is, it is also time to reflect on what a sensible allocation to equities should be in the context of a balanced portfolio positioned primarily for capital preservation. The good news (if any) from the chart is that there is time for this reflection before deciding just how much, and how fast, to get out of Dodge. This week and next we have a special report from Tim Price, Director of Investment with PFP Wealth Management. 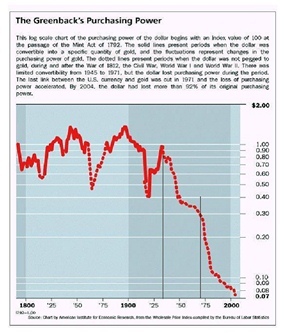 - 1961 Federal Reserve Bank of Chicago paper, via Zero Hedge. - Headline from The Onion. Historians are taught to discriminate between primary and secondary sources. At the risk of oversimplification, primary sources amount to original history and secondary sources are comment. Financial markets accommodate a similar distinction. Primary sources are objective market prices - a statement of fact (even if those same prices are distorted by central bank action, the price remains the price). Secondary sources are comment - a subjective statement of opinion (for example: editorial from a publication such as The Financial Times will report the price of gold and quickly add that it’s a bubble). Given the “drinking from a fire hose” nature of our web-enabled world, and the stubbornly finite number of hours in a day, the chances are that most consumers of financial news receive their commentary as secondary sources, filtered via somebody else’s prejudices. Consumers of financial news are also surprised and prone to intellectual denial when they hear the suggestion from market participants that news typically follows the price, rather than the other way around. The decline is worse than shown, in that graph 1 doesn’t take into account the history of the recent bail-outs and quantitative easing programmers. But the direction of the currency is clear, and it isn’t up. In the interests of not frightening domestic readers, the path of Sterling isn’t shown, but is comparatively worse. Investment conclusion #1: hedge against ongoing currency degradation with precious metals, starting with gold. 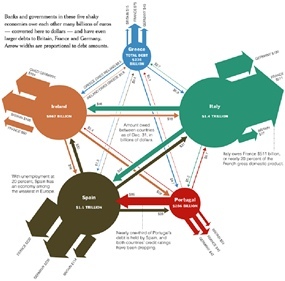 There are other reasons to use graphical representations of markets. Humans are hardwired to recognize patterns and to process images. The earliest forerunners of a written language, on the other hand, started to appear around 6,000 years ago - which in the context of our entire history as homo sapiens, is the blink of an eye. So images carry a lot more weight than text. Take, for example, the network of debt obligations between the nations of Europe, courtesy of the New York Times (see graph 2). This research is based on the fact the private sector, but not including the mining and finance sectors, has not been doing too well recently and that the economy is not doing as well as people think. This can be seen by the fact the retail sales for this year have now turned negative and house sales are flat for 2011. Another reason for the Aussie Dollar being so strong for the first few months of the year is that the Central Bank has been very aggressive on rates. However, one of the largest mortgage insurers, QBE, believes that if the Central Bank did raise rates by 0.5% then 20% of house owners would not be able to repay what they owe on their property. If this is true then it will be difficult for the Central Bank to put up rates in the near future as it would increase the pressure on property prices and worsen an already bad situation with debt servicing levels higher than that of the USA during the sub-prime era. It will also not help the Aussie cause that Moody’s, on 18th May, cut the credit ratings of Australia’s big four banks. The reason stated was that they rely far too much on overseas debt markets. This followed on from the negative ratings watch in February. This downgrade now means that Moody’s have reached the same conclusions as Fitch and Standard & Poor. In the world of FIAT there are always accidents waiting to happen and whilst the AUD may not be the most obvious it is there ready to be taken down. In the near future all eyes are on the USD, GBP and EUR. However, these are all in for a volatile ride but if the AUD is valued against gold or a stable currency like the Singapore Dollar (SGD) then it will be in for a rough ride as will the values of Australian property and the banking sector. The only thing that may delay this is if the Central Bank raises rates again. Even if this happens, it is only delaying the inevitable. Get out of AUD now and take gold as a currency bet and SGD, Thai Baht, Malaysian Ringgit and Indonesian Rupiah as a currency hedge - unless there is evidence of a flight to USD in the short term. UK Prime Minister Harold Wilson once said, “A week is a long time in politics.” Well, 2 ½ years must seem like a lifetime in finance as we have gone from the sublime to the ridiculous. Just to remind those people who were vacationing on Mars, this was the month when stock markets all over the world tanked and central banks started to print money at a rate not previously known in the hope of stopping a total worldwide financial collapse. Yet despite us narrowly avoiding falling into the abyss people have been setting up new funds and investing in equities as though there is no tomorrow. In America, the Investment Management Association showed that in the most recent tax year the net ISA sales went up to GBP3.7 billion which is the second highest total since the turn of the century. It all looks so rosy now. This is why equities have done so well. Since the market lows of just over two years ago, equities have shot up, as has gold and other commodities. However, the total of American issued debt has risen by over fifty percent. So why has all this happened? Why have investors forgotten what happened less than three years ago? It was the Spanish philosopher Santayana who wrote that, “Those who have not read history are condemned to repeat it.” It would seem that present day investors have forgotten how to read. MBMG wrote a twenty four page article last month entitled the Four Horsemen of the Apocalypse. In this we explain the past, present and future and how to avoid any potential pitfalls. Basically, précising the entire commentary, it says that the future is bleak, if it was possible to live off what you had in the bank then great but with interest rates at no more than three percent then it will be very hard to do this. Therefore, you have to invest whether you like it or not. So, multi-asset, multi-management investment is the way to go whilst remaining, above all, liquid. If you would like a free copy of our leaflet then please just let me know.